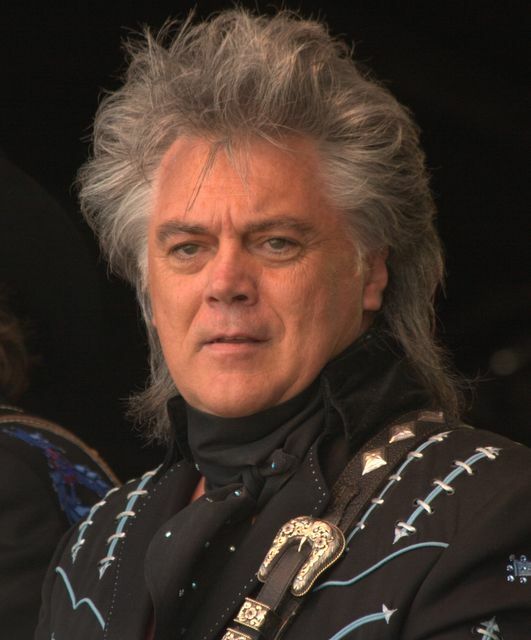 A musical prodigy, singer, songwriter, record producer, writer, photographer, raconteur, collector, and archivist, Marty Stuart is among the most versatile figures in modern country music. Born John Martin Stuart in Philadelphia, Mississippi, on 30 September 1958, he was drawn to gospel, bluegrass, and country music almost from infancy. Stuart was already a skillful mandolin and guitar player by the age of twelve, when bluegrass Lester Flatt hired him. After the ailing Flatt disbanded his group in 1978, Stuart toured with fiddler Vassar Clements and guitarists Doc and Merle Watson. Stuart next joined Johnny Cash’s band, remaining there until he started a solo career in 1985. He also married Cash’s daughter, Cindy. From his boyhood, Stuart had squirreled away country music memorabilia in his room. As his income grew and his contact with his musical heroes intensified, he became a more systematic collector of costumes, instruments, letters, song manuscripts, photos, and related material. He acquired a trove of Hank Williams artifacts so imposing that the Country Music Hall of Fame and Museum borrowed it for an exhibition. Stuart’s array, which he labeled Sparkle and Twang, has subsequently been displayed at the Tennessee State Museum and in numerous other venues. Stuart also developed a passion for wearing and collecting the ornately decorated Nudie and Manuel stage costumes long favored by such traditional country acts as Porter Wagoner and Little Jimmy Dickens. The flashy dress and tall “rooster comb” hair became Stuart trademarks. Stuart released his first album, Marty, with a Little Help from His Friends, in 1977. While it did not gain much critical attention, the follow-up collection, Busy Bee Café in 1982, did. Critics loved it. Stuart signed with Columbia Records in the mid-1980s but failed to chart any substantial hits there. He had better luck with his next label, MCA, where he scored five Top 10 singles, including “Hillbilly Rock,” “Tempted,” and “Burn Me Down.” His 1991 duet with Travis Tritt, “The Whiskey Ain’t Workin’,” won a Grammy for Best Country Vocal Collaboration. Stuart has also won several other Grammy Awards. In 1992 Stuart became a member of the Grand Ole Opry. Five years later, after the end of his marriage to Cindy Cash, he married fellow Opry star Connie Smith. Rutledge Hill Press published his annotated book of photographs, Pilgrims: Sinners, Saints, and Prophets, in 1999. The next year Stuart produced the soundtrack album for the Matt Damon and Penelope Cruz movie All the Pretty Horses. Stuart became increasingly busy as a producer after the turn of the twenty-first century, masterminding records for Billy Bob Thornton, Jerry and Tammy Sullivan, Andy Griffith, Kathy Mattea, and Porter Wagoner, among others. In 2007 he published his second photo book, Country Music: The Masters. In recent years he has continued to record, and his Sparkle and Twang exhibition was featured at the Autry National Center of the American West. From 2008 to 2014 Stuart hosted The Marty Stuart Show, a television program featuring performances by contemporary and classic country and bluegrass stars. In 2009 Neshoba Country pronounced July 8 Marty Stuart Day, dedicating a road marker in his honor near Philadelphia. In 2010, Stuart was honored with the second marker dedicated on the Mississippi Country Music Trail, which he was instrumental in founding. In 2017 Marty Stuart and his Fabulous Superlatives won the Group of the Year Award from the Americana Music Association.